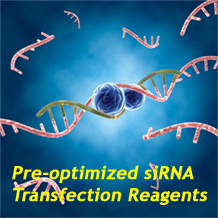 GenMute™ siRNA Transfection Reagent for SMC is pre-optimized for transfecting siRNA to smooth muscle cells (SMC). Refer to the following optimal transfection conditions for maximal silencing on SMC. GenMute™ reagent, 1.0 ml, is sufficient for ~833 transfections in 24 well plates or ~416 transfections in 6 well plates. Store at 4 °C. If stored properly, the product is stable for 12 months or longer.